Home“Hello World”, and What the Heck is a Text Editor? First, you need to create a text file. (Inner monologue: Oh sure, I know what those are! Like a Microsoft Word document, right? Nope …of course not, that would be too easy!) Microsoft Word is a word processor. To write and run a program, you need to create a plain text document with a text editor. A text editor is simply a program that is used for creating and editing plain text files, as opposed to document files created by word processors. Word processors have a lot of fancy bells and whistles. For example, bolded and underlined fonts, and formatting for columns and tables. Files you create with text editors don’t need any of the fanciness, they just need lines of text that your computer can read. You use the text you can write in text editors to write code that your computer can then interpret into programs. 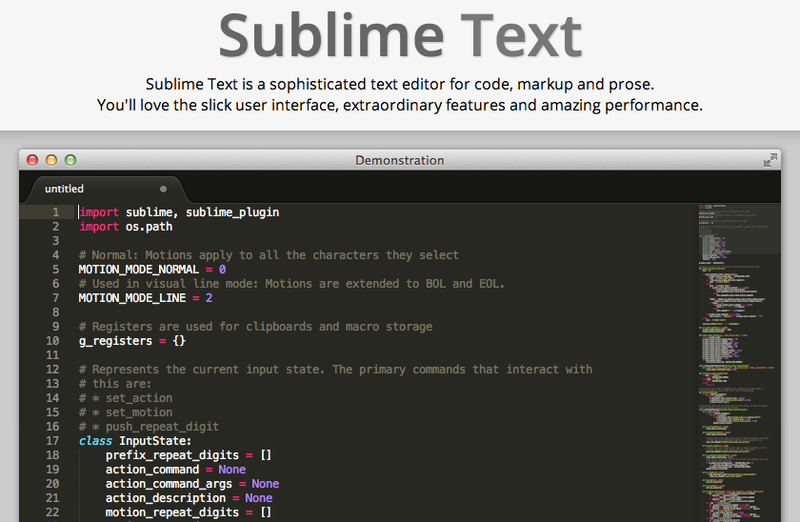 There are plenty of text editors you can choose from, and many are free. If you happen to be an extreme beginner like me, it’s not really going to matter which you choose. I chose Sublime Text, because it came recommended by a couple of people, and figured I’ll learn more about the affordances of it and others in the future. 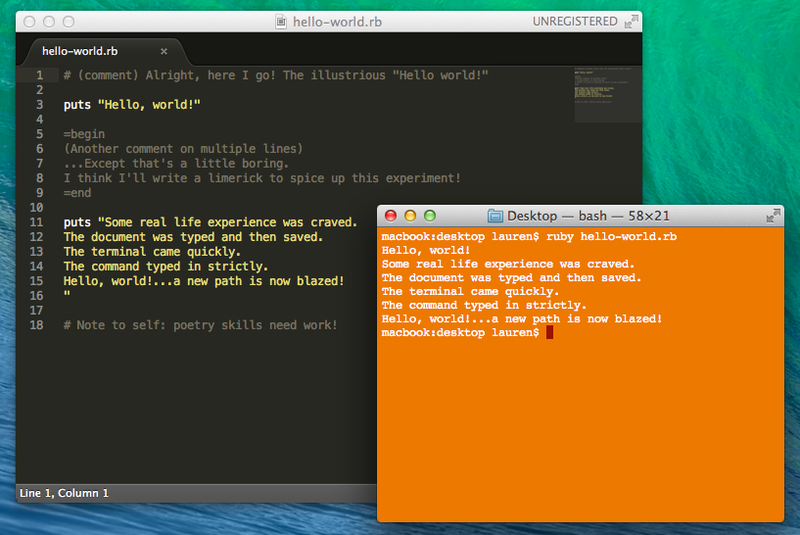 I opened Sublime Text, wrote some simple Ruby code, and saved a document to my desktop called hello-world.rb. 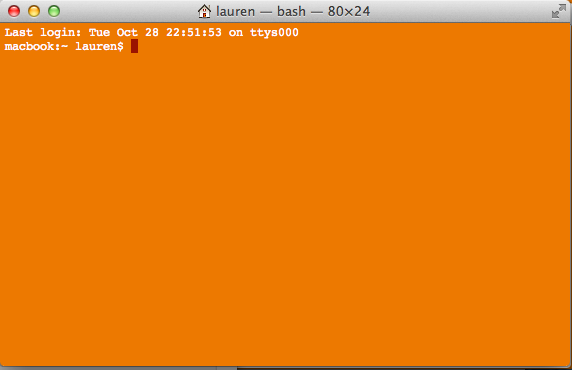 My Terminal is orange because orange is the prettiest color! I made it orange by changing my preferences. If you have no idea how to find it, just search your computer for “Terminal”, and I promise it’s there! Your Terminal is able to interpret and run the code you write in text files, such as my silly little hello-world.rb. And presto…my program ran! It was neat, but I couldn’t help feeling that simply saying “Hello World” was a little dull and played out. So, I went back to the text file and added a limerick and some comments to make it more lively. I’m not feeling great about my poetry skills, but it feels pretty darn swell to get my computer to recite poetry to me! Below you can see the plain text file I created (left), and the conversation I had with my Terminal (right). At a glance it might look like nonsense, but I bet you can figure out what I did by taking a closer look! ← Should Everyone Learn to Code? This puts you more in control of what is happening.